Thanks to William Allegrezza at Moria Books, and to over 140 contributors, The End of the World Project (eds. Richard Lopez, T.C. Marshall and me) is now published. In two volumes. Two big fat volumes. Copies are available at Moria (scroll all the way down to the very bottom of the page where you will find the book. Click on the cover and download a free pdf. Or buy a copy. It's up to you. Please check out If They Hadn’t Worn White Hoods, 8 Million Would Have Shown Up in the Photographs, by John Bloomberg-Rissman and Eileen R. Tabios, over at Moria Books. THE LINK SHOULD TAKE YOU TO A FREE PDF, THO I BELIEVE YOU CAN PURCHASE A HARD COPY IF YOU'D LIKE. A copy will be sent to Trump. I doubt he will enjoy the read. so that they can use me. so that to serve putting my people to sleep. longing for my verses to become popular songs. the sabotage actions in which I won't be participating. are waiting for us in the corner. Translated by G.Chalkiadakis (slightly modified, tho I don't know Greek). the goddess has left him. – and anxious to say it? 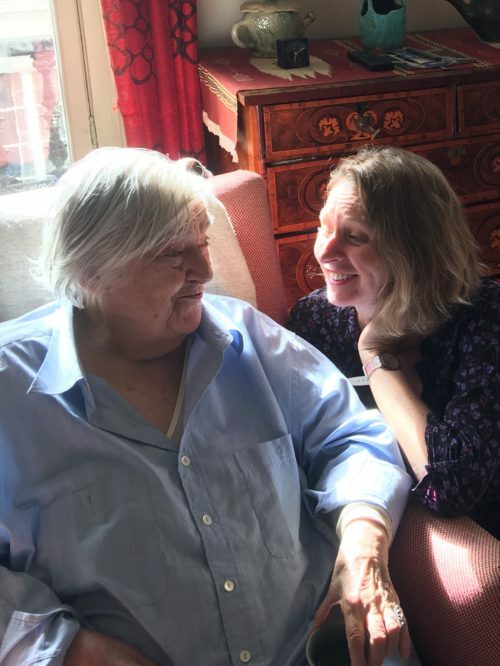 Pierre writes: It is a pleasure & an honor for Nomadics blog to publish BAALBECK, a sequence of poems by Etel Adnan translated by Sarah Riggs over the next 4 or 5 days. Below, the opening sections of the poem & a note by Etel Adnan concerning the circumstances of the work. Tears in my eyes at this idea of being waste! I’m whining, ready to pray, but just can't make myself. A moment later I'm clenching and unclenching my teeth, and drowsiness sets in. A toothache strikes, my brain turns to mush. I'm writing and appealing - but hoping for relief from the pain makes me feel that much worse. A slipping, glance down, the molar's extracted, but the anaesthetic isn't working? What an awful experience! What would it be like, how big a coward would I have been, without the hope the cocaine gave? When I get home, I bleed profusely. I stick my tongue in the hole . . . there’s a piece of meat there, a blood clot getting larger, starting to protrude. I spit it out - another follows. The clots have the consistency of snot, taste like food gone bad. They’re plugging up my mouth. I decide that by falling asleep I’ll get over my disgust, won’t be tempted to fuss with them or spit them out. I drift off and wake up at the end of an hour . . . Blood streamed from my mouth in my sleep, stained the pillow and sheet, and there are clots stuck in the sheet-folds, almost dry, some black like snot. I'm still upset and exhausted. I'm picturing an incident of haemophilia, maybe followed by death (is that so impossible?). I don’t want to die. Or maybe what I mean is - to hell with death. My disgust grows. I put a basin at the foot of the bed to avoid getting up during the night to spit in the toilet. In the coal stove, the fire’s gone out and the thought of having to start it again depresses me. I can’t get back to sleep . . . Time drags on. Sometimes I get drowsy. At 5 or 6 in the morning I decide to light the fire. I might as well make some use of this insomnia and get a thankless job out of the way. The ashes from the stove have to be taken out. I do the job badly, and soon the room’s strewn with pieces of coal, clinkers and ashes. The enamel basin is filled with blood, it’s dirty with it, and with clots, the blood has made puddles on my filthy sheets. Exhausted by insomnia, I’m still bleeding and the snotty taste of the clots gets more and more disgusting all the time. Finally the fire catches. My hands black with coal and dirty with blood. Blood-caked lips. A thick coal smoke fills the room; as usual, it takes a huge effort to get the resistant coal to catch fire. I'm not impatient, and no more anguished than other days. There's a nagging need in me . . . to rest. Now, I don’t want to reduce Bataille, who was a complicated man. Nevertheless, as soon as I read ‘Without your pain, you're nothing!’ and these few paragraphs, a great deal fell into place. I could finally feel him as a fellow human. How many of us say on some level, ‘Without your pain, you're nothing!’ Judging by behavior, I’d guess the vast vast vast majority. I include myself, which should be needless to say. Please see Galatea Resurrects for the images to which Eileen refers below. Words exist. Do we write or re-arrange what already exists? One can create new words, new vocabulary. But letters already exist—are we still just rearranging? Is this when we might lapse to the image for at least covering more territory—the picture as a thousand words? Yet, images pre-exist before our presence, too. Do we create or re-arrange...? That’s the way it should be, and I’m glad to have reached that conclusion from this collaboration by Lynn Behrendt and John Bloomberg-Rissman. For any binary that erases authorial subjectivity is a false binary—subjectivity is part of being human. Indeed, the existence of the Introductions on their process attest to the significance of their roles: the reader learns that Behrendt’s collage approach reflects her efforts to understand the world; Bloomberg-Rissman collages to see the ruins among which he says he tries to exist (because the ruins exist). The eyes are not necessarily the first detail one notices in the above collage. But, for me, once I noticed the eyes they held my attention longer than the other details. Behrendt saw, is seeing, will see. The disruption of time is also interesting for evoking what I know of as specifically “indigenous time”—a time I’ve described elsewhere as where there is no past, present or future and all is one and one is all. —which reflects Bloomberg-Rissman’s intention (elsewhere in his Introduction) of “trying to exist in the ruins.” Bloomberg-Rissman—or Behrendt—are not being fatalistic, per se, by acknowledging our doomed times. They still desire to make efforts in their lives rather than just passively accept the effect of larger forces like war, power, pollution, economic monopolies and so on. I admire the desire to do “the hard work of adapting” to these forces. We live in the macro (the larger world) but we also live in the micro (our individual lives). It’s a testimony to both Behrendt’s and Bloomberg-Rissman’s remixing capabilities that a poem succeeds when it begins with the title “VOLKSWAGEN RECOMMENDS,” cites Miss Piggy, and then ends with the powerful line “We are all Palestinians now.” Against this narrative, it’s appropriate for Behrendt’s face to be big (rather than, as in other artworks, be tiny and not immediately discernible) for her “I”—as with all “I’s—are implicated. An interesting irony—which is also a strength—to this text/image collaboration is how the texts and images work effectively on a stand-alone basis. This is important because the relationship between text and image may be clearer in some pairings than other such couplings. What then would move the viewer/reader to connect the presented combinations? Well, it can be the individual power of the works. If one of the text/image diptych is weak, I, for one, would not be (as) compelled to continue pondering the relationship between the two. Thus, each work together results in 1 + 1 > 2; there is the result of reading text, looking at image, then considering both in relation to each other for an enhanced (third, thus > 2) response. Indeed, while I’ve read other poems by Behrendt in the past, her remixed words make me want to return or explore anew her other works—a response that says something positive about the strength of the works. It’s also worth noting that this book is yet another fabulous production from the publisher, Lunar Chandelier Press, which is helpful for enhancing the impact of the work. Ultimately, the power of these works rely on how masterfully Behrendt accomplishes her collages and remixings. I use the term “master…” because I make this conclusion, too, as a practitioner. I know the difficulty of creating visual collage that offers a sense of organic wholeness precisely because I’ve mostly failed to effect that result. It wasn’t easy, but I managed to use the phrase … because I had the faith or choose to have the faith, and it seems to me (and this is why I raise it in this review) so do Behrendt and Bloomberg-Rissman, that words can work together in any combination for such is the power of art and poetry. This book, for one, so testifies eloquently … and beautifully. Perhaps the world would not be in such a dire state if its creatures, too, chose to work together positively in any combination with each other.